If you’ve ever considered getting permanent makeup – eyeliner, lipliner, or eyebrows – you’ve come to the right place! Choosing to get permanent makeup is a huge decision, so it’s important to be well-informed beforehand. We’ve compiled several expertly-crafted articles and videos that will teach you the basics of permanent makeup. Check out the post below to see the complete guide, and be sure to let us know what you think in the comments! Permanent makeup is just that – permanent! Which means it’s incredibly important to be well-informed and do a ton of research before deciding it permanent makeup is right for you. In the two articles below, makeup experts Ryan Quisumbing and Jayna Davis explain the basics of permanent makeup. Check out the post below to learn why many people choose permanent makeup, as well as the pros and cons of this kind of procedure. Permanent makeup is a somewhat older type of technology that has continued to stick around. Permanent makeup classes teach those who tattoo to put ink on the face that looks as if it is makeup. While some people may seem permanent makeup as a technology for those who are lazy, those who take permanent makeup classes are not thinking of that; they are thinking of those who are unable to apply makeup on their own. Those who have trouble can be helped by permanent makeup. When it comes to makeup, eyesight is key. When people see bad makeup on someone, they will often ask themselves if the person can even see themselves. Some people have trouble seeing, and therefore have trouble applying makeup. Permanent makeup classes teach people to apply makeup so that people who have trouble seeing can consistently have the look of well-applied makeup. When some people go through permanent makeup classes, they may not realize who they are helping. There are people, both young and old, that have trouble staying steady. Some people have conditions or problems that cause them to shake. Anyone who has tried putting on makeup while shaking will realize how hard this can be. Permanent makeup helps those who have steadying problems have a complete look, with makeup and all. Those who have had allergy problems with jewelry will begin to understand the problem of those who are allergic to makeup. Some people are allergic to makeup, generally because of the materials in the makeup. The way that their bodies react to the makeup means that they cannot wear it. Permanent make up classes and permanent makeup can help these people to have the look of makeup without the actual makeup. Because they are not allergic to the ink that is used to tattoo on the face, they can handle the ink, and their bodies will not have the same issues as with makeup. When it comes to simple, everyday tasks such as makeup, people tend to forget those who cannot do them. Because it is such a normal activity, those who cannot do it are often frustrated. Permanent makeup classes allow people to do more than tattoo makeup onto the face; permanent makeup classes allow those to help out people that have issues applying makeup. I’m the kind of person who likes to look good, but dreads having to roll out of bed in the mornings because I’ll have to go through all of the elaborate minutiae of makeup application. Every morning is a personal war for me; and it sometimes got to the point where I would lie in bed with the covers tucked over my head until two in the afternoon, simply because I didn’t want to bother with my exceedingly tedious morning routine. The thought has occasionally occurred to me to skip putting on makeup altogether, but I haven’t left my house without makeup on since before I was in high school, and I don’t intend on changing that now. After another completely wasted Saturday morning spent lying in bed and trying to pretend that I was still asleep though, I finally decided that I had had enough. I searched the internet for permanent makeup options. I wanted to start out slowly; with a little permanent eyeliner or permanent lip liner or semi permanent lip liner maybe. If you’re wondering what permanent makeup is; it’s essentially makeup that’s been tattooed directly onto a person’s face. The difference between permanent lip liner, for example, and the butterfly tattoo a person might have had inked onto their lower back, is that whereas tattoos are mostly meant to make a statement of some sort about somebody’s personality, makeup is simply meant to enhance (or slightly alter) whatever’s already there. As mentioned in the last paragraph, permanent makeup is basically a bunch of tattoos. This means that it is usually applied the same way tattoos are; except that they’re almost always applied by a plastic surgeon, since facial skin is much more delicate than the skin in most of the rest of the body, and since the tattoos are usually placed really close to important parts of the body, like the eyes. Does applying permanent makeup hurt? The short answer to that one is “yes.” Getting a tattoo is essentially getting punctured a lot of times with an ink-filled needle. A permanent makeup job will be essentially the same thing. 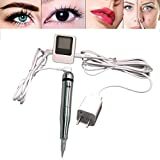 A permanent makeup machine; a device used specifically for the application of permanent makeup will often be used; although it pretty much does the same thing a tattoo needle does: deposit pigment into deep layers of skin. With permanent makeup though, it isn’t applied as deeply, and since it’s applied to the face, most plastic surgeons will apply topical or local anesthetic to whatever you want to put makeup on. The most you will probably feel will be some minor discomfort, and there may be a bit of swelling and stinging afterwards as well. You might want to ask your doctor about what you can do to deal with the after-effects. What are the pros and cons of permanent makeup? The first con is fairly obvious. It’s permanent. You’ll have it for the rest of your life. Or, since it’s really likely that the ink will fade over time, you’ll have it for at least a few years. This means that if you opted to have blue permanent eyeliner, you’re going to have to live with that particular permanent eyeliner color for a while, unless you’re willing to undergo costly and painful (usually more painful than the permanent makeup application process) tattoo removal to get rid of it. Of course, this is probably the reason why people get makeup in the first place, so it counts as a pro as well: the fact that it stays. It’s really a double-edged sword. This is why if you want to get makeup, you have to think long and hard before making your decision; there aren’t any morning after take backsides once you have this kind of makeup on your face. A lot of clinics and beauty centers where makeup services are being offered will also have specialists to help you with your color and design choices. To get the look you want and avoid infections, make sure that you get a cosmetologist or permanent makeup specialist you trust, who uses sterilized equipment. 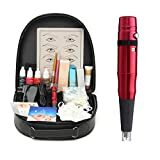 Another con to permanent makeup is the cost; something as simple as permanent eyeliner can set you back anywhere from three hundred dollars, to a thousand. It does help you cut back on the need to buy eyeliner every few weeks or months though, which does save you some money. If you think about it, this isn’t that much of a con, really. 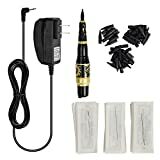 Makeup Tattoo Pen: Its very light and the needle is easy to change. Beautiful Appearance: Engraved with dragon totem pattern, small noise and strong horsepower. Eyebrow Pen Size: Tip size 2.5 x 0.6 x 0.4cm(L x Outer dia x Inner Dia), needle size 1.97x 0.01inch/5 x 0.03cm (L x Dia). Tattoo Pen Design: Easy to control and operate, durable and exquisite. Package Included: 1 x Tattoo Eyebrow Machine, 1 x AC adapter, 50 x Needle, 50 x Tip as picture. What about semi permanent makeup, like semi permanent lip liner? Is there a difference? That depends on who you’re talking to. Permanent makeup is often also called semi permanent makeup; so you can opt to refer to your new lip liner job as semi permanent lip liner or permanent lip liner. Sometimes though, there can be a small difference between semi permanent and permanent makeup. Some brands or cosmetic lines will tout their products or services as semi makeup, but will actually refer to ordinary cosmetics formulated to be especially long wearing. Whether you’re planning on giving makeup a try and going under the cosmetologist’s needle with permanent eyeliner or semi permanent lip liner, or simply finding some reeeeeeaaally long-wearing semi permanent lip liner though, getting the colors and services that suit your needs can be easy, if you know what you’re looking for. In the video below, beauty gurus Michelle and Laura of the MMandLShow visit Janette, a permanent makeup technician and expert. Michelle is back for a second round of permanent makeup on her eyebrows, as well as her first round of eyeliner tattoos. During the procedure, Janette provides expert tips and tricks for choosing the right type of permanent makeup, as well as advice for the healing process. Watch Janette perform the entire procedure in the video below, and check out some of the video highlights in the transcript below. Laura: So what are you doing right now to Michelle? Janette: I’m just numbing her. And I’ve put a little dye on her eyelashes because she can’t wear mascara for five days. L: What would you recommend to all of our subscribers in different locations if they’re not able to fly to come and see you? J: So they want to go and either see pictures [of permanent makeup]. Actual work is better to see. I am a referral-based only business. You can get some referrals from the person that you’re going to go see. Websites are great, pictures are great, but even if you could see some actual people, that would be better. Good permanent makeup shouldn’t be spotted, so that’s the problem with finding people that have it done. J: After having these tattooed, you need to keep up on dying your eyebrows. That’s the biggest mistake people do, especially the blondes. And so I always tell them that, okay, you cannot have tattooed skin and blonde fuzz on top of your face. That looks ridiculous. L: So probably one of the hardest things about tattooing is picking out the color? J: The color, and finding a color that’s going to correspond to a makeup color because it’s not the same world. So it’s finding a color that’s neutral but warm, that’s not yellow, that’s not pink…so it’s hard to find the right mixtures. [Michelle’s] last color was like the dark sienna, which is almost like black-brown. Michelle: You want to plan [this procedure] when you’re not doing something important for like, the following week, right? J: Yes. You’re going to look overdone…Later we’ll actually start to slip off from these in three to five days, and then they’ll lighten. But until that point, you cannot put makeup over them. J: You’re going to get a little bit of scabbing, but what you want is just a scabbing that flakes. You don’t want a big, deep scab. The key to keeping this in really good is to keep a lot of ointment on it so it does not scab. Vitamin E oil that are in the capsules, if you pop them a couple times a day and rub that first, or just squeeze it on there first, it filters down between the hairs so it really sticks to the skin. And then you want to put a really tacky ointment on top. Aquaphor is awesome for eyebrows…You basically want to keep [your eyebrows] so moist, so wet that they don’t scab. You’re going to have a layer that comes off anyways, but you want to try to avoid scabbing. I tell clients to do it every hour; that’s overkill, but they actually will do it every two hours. And then before you go to bed at night, you really want to cake on whatever you’re using. You want to do Vitamin E then Aquaphor, or you could use Vaseline over the top. You never want to use Neosporin around your eyes…Some people can have this hideous reaction to it…and the whole eyes swell up. It’s awful. So I would never recommend using any kind of Neosporin [or] polysporin on the eyebrows…And you normally wouldn’t even know you’re allergic to it…you would just be getting red and swollen and puffy. And people usually make the mistake of applying more Neosporin at that point, thinking they have an infection and it just gets worse and worse…So you’re better just to use Vitamin E oil, Aquaphor I think is one of the best, Vaseline, Bag Balm. I make a little concoction of avocado, Vitamin E oil, shea butter, and Aquaphor. So it’s really tacky and it sticks well. L: When should someone come back? Does everyone need a touch-up? J: Yes, you want to give them six to eight weeks. Some technicians will tell you as early as two weeks. I would not recommend going back in two weeks; the skin is not healed. L: What is the cost of getting your eyebrows done? J: Eyebrows are $350; sometimes down to $300, up to $400. But some people that are just going to do a hairline might charge you less, might charge you more. Do you need a full eyebrow done, do you need a half eyebrow done – and some people could just charge less. L: And then what about eyeliner? J: If it’s top and bottom waterline, $400. And lashline. So that’s a full eyeliner. If you just want it top, it’s $300. L: This is crazy. So you’re doing the waterline? J: I’ve gone over [the waterline] once just a little bit, and then I’ve put…a secondary numbing, which is more of a gel form, and it usually works best once the skin’s been broken. L: And what color are you doing? J: This is a black, black brown. You typically don’t want to put a straight black in their eyes because it’s got so much blue in it that it gets blue really fast. L: So what are some things people should be aware of in regards to getting their eyeliner tattooed? J: A lot of people are using lash growth products…I recommend going off them one to two months before you get your eyeliner tattooed. The reason being is… that is actually a capillary bed that kind of gets pulled up to the surface. Once you have that much blood supply to the lashes, this becomes very bloody. And what happens is that as you go over [the top waterline], you’ll get a bruise layer that will come out. Ink is a bunch of particles in a liquid. So once the liquid is reabsorbed by the body, you’re left with all these particles. But if you get a big bruise out here, all these particles can run into that bruise. So that’s going to give you this really fuzzy line; it’s called migration. You want to go off for two months – plus it makes it hurt so bad because you are bleeding. The other thing is…ask your technician if they use a product called Celluvisc. It’s a thick eye drop. So I keep putting this into her eye the whole time, so that’s going to coat her eyeball…and I put the numbing cream on. You’re going to have lower risk of corneal abrasion, meaning the numbing cream can burn your eyeballs, so you really want to use a lot of Celluvisc so you don’t have a corneal burn from the numbing cream. L: Can you do [the procedure] if you’re pregnant? J: I don’t like to do pregnant women. The reason is, I like you to take Benadryl before coming, or an antihistamine. And if your technician doesn’t tell you that too, it’s just a great thing you can do by yourself. Take an antihistamine, I usually say Benadryl, the night before and one before coming…It helps to dry up your eyes and it helps them not swell so much, and it helps them not water so much. J: Breastfeeding, usually you’re okay. M: What’s the biggest mistake people make after [getting permanent makeup]? J: Do not wash [your eyebrows] with soap. Don’t put any facial products on them. They can get wet, but you don’t want to overdo the water. No hot tubs, no steam rooms, no swimming pools. This is for five days. And no makeup. The biggest mistake is they let [their eyebrows] dry and they try to put their makeup on. Letting them dry is the biggest mistake. You want to keep this so lubricated that it doesn’t have a second to dry, and it will stay in perfect. M: So how long until you know the final result? J: [Eyebrows] will continue to settle for more than a month. So they’ll keep fading, they’ll soften, the color might change still just a little bit. I would say give everything at least four weeks. Within a week, you pretty much know what’s going to stay on the eyes. L: This is the next day at 11:00 at night. [Her eyes] were a little bit more swollen this morning. They’ve actually gone down. Wouldn’t you say? M: Yeah. When I woke up this morning I actually couldn’t open my eyes – they were crusted together. M: Day two. I was really bad at keeping the lubricant on. L: How many times have you iced? M: Just like once, you know. M: My eyes are quite bloodshot today, but the swelling has gone down. My eyes are protruding less. And I did ice my eyes last night. M: No swelling, the brows have faded nicely. I feel like I can go out in public. L: It looks really good! Do you have any permanent makeup tips of your own? We’d love to hear them! Share them with us by leaving your comment below. Be sure to follow our Facebook, Twitter, Instagram, and Pinterest accounts to get the latest makeup, hair and nail trends!